The food is consistently good at Old South and we like the fact that we always know exactly what we will get each time we eat here. The food reminds me of traditional diner fare. I love the chef salad with ranch. It’s nothing fancy, just a normal lettuce tomato type salad but I love it. Over the last couple months we have traveled I-40 leaving FL and now returning. Each time we have found ourselves in Russellville, AR and had the privilege of dining here 3 times. Twice for dinner and today for breakfast. I can’t speak highly enough on how friendly the staff is! My omelette was prepared just the way I ordered it, and the fried chicken is cooked to order, so expect a little wait that is well worth it. 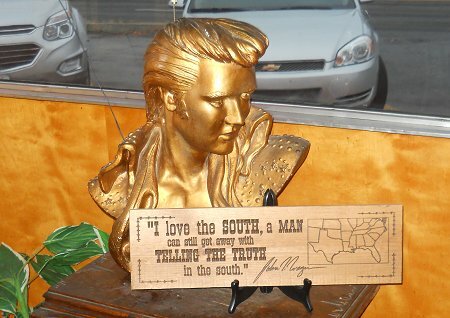 I heard Elvis used to eat here and had a special fondness for the Old South salad dressing, which they still carry on the menu. You need to like mayo, I thought it was good. Hard to find diners like this anymore!